Beta cell inflammation and demise is a feature of type 1 diabetes. The insulin-sensitising molecule ‘adaptor protein, phosphotyrosine interacting with PH domain and leucine zipper 1’ (APPL1), which contains an NH2-terminal Bin/Amphiphysin/Rvs domain, a central pleckstrin homology domain and a COOH-terminal phosphotyrosine-binding domain, has been shown to modulate inflammatory response in various cell types but its role in regulating beta cell mass and inflammation in type 1 diabetes remains unknown. Thus, we investigated whether APPL1 prevents beta cell apoptosis and inflammation in diabetes. Appl1-knockout mice and their wild-type littermates, as well as C57BL/6N mice injected with adeno-associated virus encoding APPL1 or green fluorescent protein, were treated with multiple-low-dose streptozotocin (MLDS) to induce experimental type 1 diabetes. Their glucose metabolism and beta cell function were assessed. The effect of APPL1 deficiency on beta cell function upon exposure to a diabetogenic cytokine cocktail (CKS; consisting of TNF-α, IL-1β and IFN-γ) was assessed ex vivo. Expression of APPL1 was significantly reduced in pancreatic islets from mouse models of type 1 diabetes or islets treated with CKS. Hyperglycaemia, beta cell loss and insulitis induced by MLDS were exacerbated by genetic deletion of Appl1 but were alleviated by beta cell-specific overexpression of APPL1. APPL1 preserved beta cell mass by reducing beta cell apoptosis upon treatment with MLDS. Mechanistically, APPL1 deficiency potentiate CKS-induced phosphorylation of NFκB inhibitor, α (IκBα) and subsequent phosphorylation and transcriptional activation of p65, leading to a dramatic induction of NFκB-regulated apoptotic and proinflammatory programs in beta cells. Pharmacological inhibition of NFκB or inducible NO synthase (iNOS) largely abrogate the detrimental effects of APPL1 deficiency on beta cell functions. APPL1 negatively regulates inflammation and apoptosis in pancreatic beta cells by dampening the NFκB–iNOS–NO axis, representing a promising target for treating type 1 diabetes. The online version of this article (doi: 10.1007/s00125-016-4185-z) contains peer-reviewed but unedited supplementary material, which is available to authorised users. Pancreatic beta cell destruction and dysfunction underlie the pathogenesis of type 1 and 2 diabetes, both of which feature aberrant immunity. Recent studies indicate that local production of diabetogenic cytokines (such as IFN-γ, IL-1β and TNF-α) by infiltrated immune cells in pancreatic islets triggers inflammatory and chemotaxis pathways in beta cells, eventually causing defective glucose-stimulated insulin secretion (GSIS) and beta cell apoptosis in diabetes [1, 2]. Inhibition of islet inflammation or IL-1β alleviates hyperglycaemia through improving beta cell function and/or mass in rodent models of diabetes and humans with diabetes [2, 3, 4, 5]. The diabetogenic cytokines bind to their corresponding receptors, which in turn recruit distinct scaffold proteins and elicit activation of a cascade of kinases, leading to activation of NFκB and subsequent induction of an apoptotic and inflammatory program dependent on inducible NO synthase (iNOS) [1, 2, 6]. Adaptor protein, phosphotyrosine interacting with PH domain and leucine zipper 1 (APPL1), which contains an NH2-terminal Bin/Amphiphysin/Rvs domain, a central pleckstrin homology domain and a COOH-terminal phosphotyrosine-binding domain, is an endosomal protein involved in multiple cellular processes, including cell proliferation, survival, apoptosis, metabolism and inflammation [7, 8]. APPL1 is crucial for glucose and cardiovascular homeostasis by mediating both adiponectin and insulin signalling pathways [9, 10, 11, 12]. Genetic ablation of Appl1 not only causes insulin and adiponectin resistance in peripheral tissues but also impairs GSIS in beta cells [13, 14, 15, 16]. APPL1 is abundantly expressed in beta cells but its expression is decreased in mouse models of dietary-induced obesity and genetically inherited type 2 diabetes . APPL1 facilitates insulin granule exocytosis by enhancing soluble N-ethylmaleimide-sensitive factor activating protein receptor protein expression via an Akt-dependent pathway in beta cells . In humans, expression of islet APPL1 is positively correlated with GSIS . APPL1 is also crucial for mitochondrial metabolism in beta cells . Whole-exome sequencing identified two large families with a high prevalence of diabetes carrying loss-function mutations in APPL1, which appear to impair insulin-mediated Akt activation in hepatocytes . However, it remains unclear whether APPL1 plays any role in beta cell apoptosis and inflammation in type 1 diabetes. See electronic supplementary materials (ESM) Methods for further details. Human APPL1 gene with N-terminal FLAG epitope and green fluorescent protein (GFP) were cloned into adeno-associated virus (AAV) vector consisting of modified mouse insulin promoter, namely AAV-mIP2-APPL1 and AAV-mIP2-GFP. The AAV vector, pRep2Cap8 vector and the helper vector were co-transfected into human embryonic kidney (HEK) 293 T cells, followed by purification using polyethylene glycol/aqueous two-phase partitioning and titration by real-time quantitative PCR analysis using primers specifically targeted for genes encoding APPL1 or GFP (ESM Table 1) . AAV-mIP2-APPL1 and AAV-mIP2-GFP plasmids were used as standard curve. Ten- to twelve-week-old male Appl1-KO mice and their wild-type (WT) littermates with C57BL/6N background , male C57BL/6N mice (Laboratory Animal Unit, The University of Hong Kong) and 20-week-old female NOD mice (Jackson laboratory, Bar Harbor, MA, USA) were used. The animals were housed in a room with temperature (23 ± 1°C) and light (12 h light-dark cycle) control and had free access to water and diet (unless otherwise noted). The investigators were not blinded to the experimental groups, unless otherwise noted. Hyperglycaemia or diabetes was defined as a random non-fasted blood glucose level >15 mmol/l. All animal experimental protocols were approved by the Animal Ethics Committee of The University of Hong Kong. For the methodologies of multiple-low-dose streptozotocin (MLDS) treatment, AAV injection and GTT, please refer to ESM Methods. Pancreases from the different mouse models (including Appl1-KO mice and their WT littermates, female NOD mice and their WT controls, C57BL/6N mice injected with AAV-APPL1 or AAV-GFP) were fixed with 4% wt/vol. paraformaldehyde, embedded in paraffin and cut into sections (5 μm thickness) as described in our previous study . Detailed procedures for immunohistochemical, TUNEL staining and morphological analyses are described in ESM Methods. Rat INS-1E cells (a kind gift from C. B. Wollheim, University of Geneva, Geneva, Switzerland) and HEK293T cells (ATCC, Manassas, VA, USA) (free of mycoplasma contamination) were cultured in RPMI1640 or DMEM supplemented with 10% vol./vol. FBS, penicillin (100 U/ml) and streptomycin (100 μg/ml), respectively. INS-1E cells were transfected with small interfering RNA (siRNA) or plasmid DNA using Lipofectamine 3000 (Invitrogen, Carlsbad, CA, USA). INS-1E cells or pancreatic islets were treated with cytokine cocktail (CKS), consisting of TNF-α (50 ng/ml), IL-1β (100 ng/ml) and IFN-γ (100 ng/ml), or PBS containing 0.1% wt/vol. fatty-acid-free BSA as vehicle. For details of islet isolation, see ESM Methods. Pancreatic tissues from Appl1-KO mice and WT controls (Fig. 3) and C57BL/6N mice injected with AAV-APPL1 or AAV-GFP (Fig. 8) were homogenised in acid–ethanol (1.5% vol./vol. HCl in 70% vol./vol. ethanol) and the insulin content of the supernatant fraction was measured using the insulin ELISA kit (Antibody and Immunoassay Services, The University of Hong Kong). See ESM Methods for further details. Isolated pancreatic islets (50 islets per well) or INS-1E cells were cultured in a 24-well plate and then treated with CKS for 20 h. NO in the conditioned culture medium was measured using a Nitrate/Nitrite Colorimetric Assay Kit (Cayman, Michigan, MO, USA) and monocyte chemotactic protein 1 (MCP1) was measured using Mouse CCL2/JE/MCP1 DuoSet ELISA kit (R&D Systems) following the manufacturers’ instructions. Caspase-3 activity was determined by Caspase-3 Fluorometric Assay Kit (BioVision, Mountain View, CA, USA), following the manufacturer’s instructions. Data was normalised with total protein concentration and expressed as fold change over vehicle control. Nuclear extracts were isolated from INS-1E cells and p65 DNA binding activity was measured using NFκB p50/p65 Transcription Factor Assay Kit (Abcam, Cambridge, UK), following the manufacturer’s instruction. p65 DNA binding activity was normalised with nuclear protein concentration and expressed as fold change over scramble-vehicle controls. Total RNA was extracted from pancreatic islets or INS-1E cells using TRIzol reagent (Thermo Fisher Scientific, Waltham, MA, USA) and cDNA was synthesised using ImProm-II reverse transcription kit (Promega, Madison, WI, USA). Real-time quantitative PCR was performed using SYBR Green QPCR system (Qiagen, Valencia, CA, USA) on Applied Biosystems StepOnePlus Real-time PCR System (Foster City, CA, USA). Gene-specific primers used for quantitative PCR analysis are listed in ESM Table 1. The expression level of target gene was normalised with Gapdh. INS-1E cells were co-transfected with NFκB firefly luciferase reporter (BD Bioscience, San Jose, CA, USA), pRL-TK renilla reporter (Promega) and siRNA against Appl1 or scramble control using Lipofectamine 3000 for 48 h, followed by treatment with CKS for 20 h. The luciferase activity in the cell lysate was measured using a dual luciferase reporter assay kit (Promega). All experiments were performed at least three times and results are presented as means ± SEM. Representative images are shown from at least three independent experiments or biological samples. Statistical significance was determined by one-way ANOVA or unpaired Student’s t test; p < 0.05 indicated statistical significance. No inclusion or exclusion criteria were used. Despite the significantly reduced levels of APPL1 seen in rodent models of type 2 diabetes , whether APPL1 expression in beta cells is altered in type 1 diabetes is unknown. Therefore, we examined APPL1 protein expression in isolated pancreatic islets and pancreatic sections from C57BL/6N mice after injection with MLDS for 5 days and from female NOD mice with or without diabetes. Both MLDS-treated mice and diabetic NOD mice exhibited hyperglycaemia when compared with their corresponding controls (Fig. 1a,b). Immunofluorescence staining revealed that protein expression of APPL1 and insulin was downregulated in pancreatic islets from MLDS-treated mice and diabetic NOD mice when compared with islets from vehicle-treated mice and non-diabetic NOD mice, respectively (Fig. 1c). In contrast, glucagon-positive alpha cells were increased in islets of mice treated with MLDS (ESM Fig. 1b). Immunoblotting analysis confirmed the significant reduction of APPL1 in islets isolated from diabetic NOD mice and MLDS-treated mice (Fig. 1d, e). To test whether a reduction in APPL1 contributes to the pathogenesis of type 1 diabetes, we injected Appl1-knockout (KO) mice and their WT littermates with MLDS. MLDS-treated Appl1-KO mice displayed a higher fed glucose level when compared with their WT controls on days 10–16 (Fig. 2a). Genetic deletion of Appl1 had no obvious effect on body weight or insulin sensitivity in mice treated with vehicle or MLDS (ESM Fig. 2). Although there was no significant difference in glucose tolerance between vehicle-treated Appl1-KO mice and WT littermates, APPL1 deficiency exacerbated MLDS-induced glucose intolerance (Fig. 2b). The glucose intolerance of the MLDS-treated Appl1-KO mice was, at least in part, due to impaired GSIS (Fig. 2c). In addition, MLDS-treated Appl1-KO mice displayed hypoinsulinaemia (Fig. 2c). Taken together, these findings suggest that Appl1-KO mice are more vulnerable to MLDS-induced beta cell dysfunction and diabetes. To investigate the underlying cause of the severe hyperglycaemia in MLDS-treated Appl1-KO mice, we measured pancreatic insulin content and beta cell area. Immunohistochemical staining and ELISA analysis revealed that MLDS treatment significantly reduced pancreatic insulin content and beta cell area in WT controls and that APPL1 deficiency further exacerbated these detrimental effects (Fig. 3a,b). Conversely, alpha cell area was increased in MLDS-treated Appl1-KO mice when compared with WT controls (Fig. 3c). Of note, such a difference was not observed in vehicle-treated mice (Fig. 3c). In situ detection of apoptosis revealed that the percentage of TUNEL-positive beta cells was dramatically increased in Appl1-KO mice treated with MLDS when compared with their WT littermates (Fig. 3d). Noticeably, TUNEL-positive beta cells were virtually undetectable in the vehicle-treated mice (Fig. 3d). To investigate whether the increased susceptibility of Appl1-KO mice to MLDS-induced beta cell loss and diabetes is due to aggravated insulitis, we examined the histology and immunohistology of pancreatic islets from Appl1-KO mice and WT controls. More immune cells, such as macrophages (F4/80 as surface marker of macrophage), infiltrated into the pancreatic islet of Appl1-KO mice, when compared with WT controls, after treatment with MLDS (day 9) (ESM Fig. 3a,b). In addition, the expression of inflammatory factors, such as iNOS, Il-1β and F4/80, was significantly increased in islets isolated from Appl1-KO mice after MLDS treatment, when compared with the expression in islets isolated from WT controls (ESM Fig. 3c,d), indicating that APPL1 deficiency exacerbates MLDS-induced intra-islet inflammation. MLDS induces beta cell loss via direct DNA alkylation and induction of local production of diabetogenic cytokines by infiltrated immunocytes in the intra-islet environment [20, 21]. Consistent with the findings in the mouse model of type 1 diabetes, APPL1 expression was significantly diminished in islets after stimulation with diabetogenic CKS for 20 h (Fig. 4a). Next, we investigated whether APPL1 deficiency sensitises pancreatic islets to CKS-induced apoptosis in an ex vivo system. Treatment with CKS significantly elicited activation of caspase-3 (a surrogate marker of apoptosis) in islets of WT controls and APPL1 deficiency further augmented the apoptotic effects of CKS (Fig. 4b). Since Appl1-KO mice treated with MLDS exhibited increased insulitis, we measured mRNA levels of chemokines, including Cxcl10 and Mcp1 [also known as Ccl2] (which contribute to the recruitment and activation of immunocytes), in islets isolated from Appl1-KO mice and WT controls exposed to MLDS in an in vivo setting or to CKS in an ex vivo setting. Expression of Cxcl10 and Mcp1 mRNA was undetectable in islets from WT controls and Appl1-KO mice under basal condition (data not shown and Fig. 4c) but APPL1 deficiency significantly augmented the expression of these chemokines upon treatment with MLDS (ESM Fig. 3d) or CKS (Fig. 4c,d). Expression of iNOS and Fas, well-known NFκB targets, was significantly higher in Appl1-KO islets exposed to CKS when compared with islets isolated from WT controls (iNos [also known as Nos2] and Fas mRNA expression is shown in Fig. 4c and iNOS protein expression in Fig. 4e). Exposure to CKS also caused a significant increase in levels of NO (the end-product of iNOS) in Appl1-KO islets, when compared with islets isolated from WT controls (Fig. 4f). APPL1 deficiency also potentiated MLDS-induced Fas expression in pancreatic islets (ESM Fig. 3d). Likewise, siRNA-mediated knockdown of APPL1 by ∼80% potentiated CKS-induced apoptosis (as demonstrated by TUNEL-positive cells, caspase-3 activity and Fas expression), chemokine (Mcp1 and Cxcl10) expression and iNos expression as well as NO formation (ESM Fig. 4). We next investigated how APPL1 inhibits CKS-induced NFκB activation. Knockdown of APPL1 enhanced the activity of NFκB luciferase reporter and enhanced the binding of NFκB subunit p65 to the DNA sequence containing the NFκB-responsive element, upon CKS stimulation (Fig. 5a, b). As expected, CKS induced a marked increase in the phosphorylation of NFkB inhibitor, α (IκBα) at serine 32/36 and p65 at serine 536 in INS-1E cells transfected with scramble control and this induction was further enhanced in beta cells with siRNA-mediated downregulation of Appl1 (Fig. 5c–e). On the other hand, knockdown of APPL1 had no obvious effect on the phosphorylation of c-Jun N-terminal kinase (JNK) and extracellular-signal-regulated kinase (ERK) 1/2 induced by CKS, excluding the possibility that the actions of APPL1 are mediated by these pathways (ESM Fig. 5). To test whether the inhibition of NFκB could reverse the increased apoptosis and inflammation in APPL1-deficient beta cells, islets isolated from Appl1-KO mice were pre-treated with the NFκB inhibitor BAY11-7082 for 30 min before exposure to CKS [22, 23]. Real-time PCR analysis revealed that the augmented mRNA expression of chemokines (Mcp1 and Cxcl10), iNos and Fas in islets of Appl1-KO mice was largely reversed by pre-treatment with BAY11-7082 (Fig. 6a, b). These effects of BAY11-7082 were accompanied by reduced NO formation and caspase-3 activity (Fig. 6c, d). Since the deteriorative effect of NFκB on beta cells is mainly mediated via the iNOS–NO pathway , we next examined whether pharmacological inhibition of iNOS could reverse the augmented apoptosis and inflammation in APPL1-deficient beta cells. Pre-treatment with the iNOS inhibitor L-NIL largely abolished CKS-induced NO formation in islets isolated from Appl1-KO mice and WT controls (ESM Fig. 6a). The elevation of caspase-3 activity in APPL1-null islets and control islets in response to CKS treatment was attenuated by treatment with L-NIL (ESM Fig. 6b). To test whether beta cell-specific overexpression of APPL1 relieves MLDS-induced diabetes, we gave C57BL/6N mice an intraperitoneal injection of AAV encoding human APPL1 or GFP under the control of modified mouse insulin promoter 2. Exogenous FLAG-tagged APPL1 was detected in islets but not in exocrine cells of mice injected with AAV-APPL1 (Fig. 7a). Immunofluorescent staining revealed that the reduction of APPL1 in beta cells induced by treatment with MLDS was partially rectified by AAV-mediated expression of APPL1 (Fig. 7b). Random non-fasted blood glucose and glucose tolerance were similar in AAV-APPL1 and AAV-GFP mice treated with vehicle, whereas MLDS-induced hyperglycaemia and glucose intolerance were markedly alleviated by beta cell-specific overexpression of APPL1 (Fig. 7c,d). 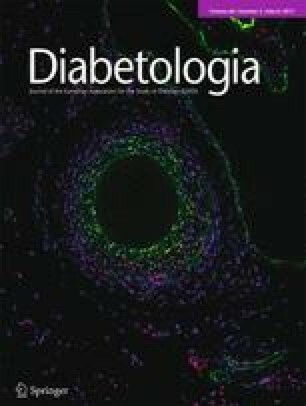 The improvement in glucose homeostasis in AAV-APPL1 mice treated with MLDS was associated with increased pancreatic insulin content and beta cell area (Fig. 8a,b). The alpha cell areas in islets of vehicle-treated AAV-APPL1 and AAV-GFP mice were comparable (Fig. 8c). The increase in alpha cell area induced by MLDS was partially abolished by overexpression of APPL1 (Fig. 8c). Furthermore, beta cell apoptosis induced by MLDS was decreased in AAV-APPL1 mice when compared with AAV-GFP controls (Fig. 8d). Pancreatic beta cell loss is a major contributor to the pathogenesis of both type 1 and type 2 diabetes. Our study shows that APPL1 protects beta cells from diabetogenic agents at least in part by dampening the NFκB–iNOS–NO pathway. The deleterious effects of diabetogenic agents on beta cell functions are exacerbated by APPL1 deficiency and are alleviated by beta cell overexpression of APPL1. In pancreatic beta cells, activation of NFκB induces a cluster of genes related to inflammation, chemotaxis and apoptosis, leading to diabetes . Inactivation of NFκB by overexpression of a degradation-resistant IκBα in beta cells markedly attenuates MLDS-induced diabetes in vivo and CKS-induced apoptosis in vitro . In contrast, constitutive activation of NFκB leads to insulitis and immune-mediated diabetes [25, 26]. The pro-apoptotic effect of NFκB in beta cells is partially mediated by the iNOS–NO pathway . Indeed, genetic ablation of iNOS abrogates MLDS-induced diabetes  and, vice versa, transgenic expression of iNOS in pancreatic beta cells results in beta cell loss, hypoinsulinaemia and diabetes and these phenotypes can be reversed by treatment with an iNOS inhibitor . APPL1 has been reported to control NFκB activity in a cell type- and stimulus-specific manner [30, 31, 32]. In HEK293T cells, APPL1 appears to enhance basal NFκB activity by promoting nuclear localisation of p65 via stabilisation of the non-canonical NFκB-inducing kinase (NIK) . However, APPL1 mediates the anti-inflammatory actions of adiponectin on endothelial cells and macrophages by attenuating NFκB activation via an unknown mechanism [31, 33]. In the present study, we showed that APPL1 negatively regulates the canonical NFκB pathway in beta cells. The upregulation of NFκB-responsive genes in APPL1-deficient beta cells upon exposure to CKS is due to increased phosphorylation of IκBα at serine 32/36 and p65 at serine 536. Phosphorylation of IκBα at serine 32/36 leads to proteasomal degradation of IκBα, which in turn allows translocation of NFκB from cytoplasm to the nucleus where NFκB initiates the transcription of its target genes . On the other hand, phosphorylation of p65 at serine 536 induces conformational changes that can promote the transcriptional activity of NFκB and/or reduce the nuclear export of NFκB by inhibiting the interaction between IκBα and NFκB . Although pharmacological inhibition of NFκB or iNOS largely abolishes the detrimental effects of APPL1 deficiency on beta cells, we cannot exclude the involvement of other signalling pathways, such as signal transducer and activator of transcription 1 (STAT1, the major downstream target of IFN-γ ), in the anti-inflammatory and anti-apoptotic actions of APPL1. Since APPL1 is a key downstream mediator of adiponectin signalling and adiponectin protects beta cells from apoptosis and inflammation, it is possible that the protective effects of APPL1 against MLDS-induced diabetes may be related to its potentiating effects on adiponectin activity [36, 37]. Taken together, our results support the notion that APPL1 protects beta cells from apoptosis and inflammation by attenuating, in part, CKS-induced NFκB activation in beta cells. Streptozotocin (STZ) enters beta cells via GLUT2 and destroys the cells via DNA alkylation. Our previous study indicated that expression of Glut2 in islets from Appl1-KO mice and WT is similar . This excludes the possibility that the increased susceptibility of Appl1-KO mice to MLDS-induced beta cell damage is due to a change in GLUT2 expression. Apart from its direct cytotoxic effect, MLDS triggers local islet inflammation and the release of proinflammatory cytokines (such as TNF-α, IL-1β and IFN-γ), in part through the recruitment of immunocytes such as macrophages and T cells [20, 21]. Indeed, depletion of immune cells or inhibition of cytokines has been shown to alleviate MLDS-induced beta cell loss and diabetes [38, 39]. In our study, MLDS-induced diabetes and insulitis were exacerbated in Appl1-KO mice. Such change is associated with augmented expression of NFκB-responsive genes, resulting in induction of local inflammation and apoptosis in pancreatic islets. This notion is further supported by the in vitro experiments showing that islets lacking APPL1 or INS-1E cells with decreased expression of APPL1 secreted more MCP1 and NO and exhibited increased apoptosis upon stimulation with CKS. APPL1 prevents stress-induced apoptosis in neuronal cells, cardiomyocytes and endothelial cells [31, 40, 41]. APPL1 deficiency induces apoptosis and developmental defects in xenopus pancreas and zebrafishes as a result of diminished Akt activity in the early endosome [42, 43]. However, these defects are not observed in Appl1-KO mice fed with a standard chow or a high-fat diet [15, 44]. In the present study, beta cell area was strikingly reduced in Appl1-KO mice treated with MLDS, whereas beta cell-specific overexpression of APPL1 had the opposite effect. Noticeably, transgenic expression of constitutive active form of Akt in beta cells prevents STZ-induced diabetes in mice . However, whether Akt is involved in the anti-apoptotic effects of APPL1 on beta cells in diabetic conditions warrants further investigation. APPL1 expression is reduced in some inflammatory conditions. For instance, treatment with lipopolysaccharide, resistin and TNF-α leads to reduction of APPL1 in macrophages, hypothalamic cells and myotubes, respectively [46, 47, 48]. In macrophages, lipopolysaccharide-dependent proteasomal degradation of APPL1 is mediated via the mitogen-activated protein kinase 1/2–ERK1/2 pathway . We showed here that beta cell APPL1 is reduced in islets treated with CKS and islets from mouse models of chemical-induced and genetically inherited type 1 diabetes (both feature intra-islet inflammation), suggesting that reduced expression of APPL1 may contribute to the pathogenesis of this inflammatory disease. Our results showed that AAV-mediated overexpression of APPL1 in beta cells partially ameliorates MLDS-induced diabetes. The modest effect of APPL1 overexpression may be due to moderated increase of exogenous APPL1 in the beta cells and/or incomplete transduction of AAV to beta cells . Although intra-islet inflammation also contributes to the development of diabetes in the MLDS model, the autoimmune feature and pathogenesis are distinct from human type 1 diabetes . Therefore, further investigation to determine whether transgenic overexpression of APPL1 in beta cells of diabetic NOD mice (which exhibit aberrant immune phenotypes as in human type 1 diabetes) prevents beta cell apoptosis and inflammation is warranted. In summary, our study reveals that APPL1 protects beta cells from diabetogenic agent (STZ and CKS)-induced inflammation and apoptosis by diminishing NFκB activation. In mouse models of type 1 diabetes, a reduction in APPL1 expression increases the susceptibility of beta cells to local islet inflammation and subsequent beta cell death (ESM Fig. 7). Thus, therapeutic strategies aimed at restoring beta cell APPL1 expression may represent a promising approach to preserve beta cell mass and function in diabetes. The data generated during and/or analysed during the current study are available from the corresponding authors on reasonable request. This work was supported by the General Research Fund (782612) from the Research Grants Council of Hong Kong, the National Science Foundation of China (81270881) and a matching grant for State Key Laboratory of Pharmaceutical Biotechnology from the University of Hong Kong. All the authors contributed substantially to the conception and design of this study and to the acquisition and analysis of data. All authors participated in drafting the article and gave final approval of the version to be published. KKYC is the guarantor of this work.